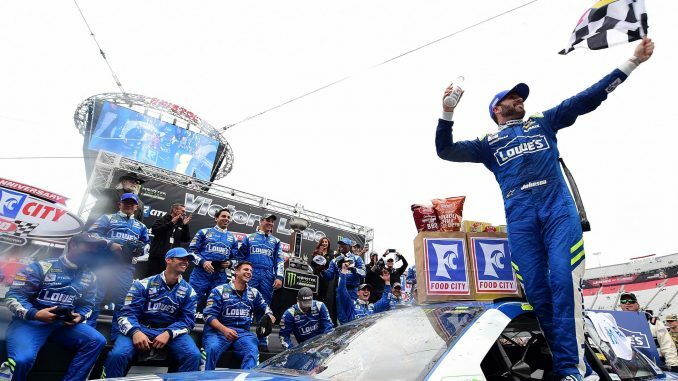 It took seven years and an extra day, but seven time NASCAR champion Jimmie Johnson stood in Bristol Motor Speedway’s victory lane once again Monday. Johnson won the rain delayed Monster Energy NASCAR Cup Series Food City 500 Monday taking the lead for the final time with 22 laps to go to scone the 82nd win of his career and his second in a row having won at Texas two weeks ago. It marked the 11th time that Johnson has consecutive wins in his career and his second at Bristol. Clint bowyer overcame a speeding penalty to finish second, Kevin Harvick was third with Matt Kenneth and Joey Logano rounding out the top five. Thanks to a sticky substance put down on the bottom of the racetrack in the turns, by the halfway point of Monday’s five hundred lap event, two grooves had opened making for some of the best racing seen at Bristol in some time, and some of the best racing this season. There were several three-way battles for the lead throughout the day as well as battles for position all through the field. Speeding penalties doomed several of the races early top runners. Polesitter Kyle Larson led the first 202 laps, and won the first stage, and looked strong nearly the entire race. A speeding penalty during pit stops during the races eighth caution on lap 420 sent Larson back to 20th. He would rebound later and had a shot to win later in the going thanks to a two-tire pit stop. In the final laps of chaos however, he was shuffled back and finished sixth. “Then I got that speeding penalty and set us back. We had to gamble there for that last stop and take two lefts and we hadn’t done that all day. Martin Truex Jr. became the car to beat as Larson fought back from his penalty. Truex would lead a total of 116 laps, but his speeding penalty came during stops on lap 261. That seemingly left the door open for Kevin Harvick who stayed out during the round of stops, along with Denny Hamlin. Johnson looked strong in the final third of the race, leading a total of 81 laps on the day. But it was the final 22 that mattered most. In a wild final lap run to the finish, Johnson and Logano fought for the lead with Johnson taking the point on lap 478 and taking command of the race. There was plenty of action behind, especially on the final lap, but no one had anything for Johnson who won by 1.19 seconds. Several big names suffered issues, including Brad Keselowski who suffered mechanical issues and finished 34th, 67 laps down. Kyle Busch lost a right front tire twice. The first coming on lap 210; he was able to continue and rallied back to seventh when he lost another right front on lap 383 and was done for the day finishing 35th. Dale Earnhardt Jr. had a bizarre incident on lap 218 when just prior to a restart his crew saw smoke coming from his Chevrolet. An oil tank had leaked putting oil on the tires; he ended up in the wall and out of the race scored 38th. In all there were 9 caution flags and a red flag that came out on lap 54 after an incident involving Kurt Busch and Chris Buescher. Kurt spun, Buescher crashed when he hit the race of Reed Sorenson who slowed. Buescher finished the day in the garage. His damaged car left extensive moisture on the track however and NASCAR was forced to stop the race for just over five minutes. Behind Larson in sixth, Chase Elliott was seventh, Truex rallied to eight, as Ricky Stenhouse Jr. and Trevor Bayne rounded out the top 10. 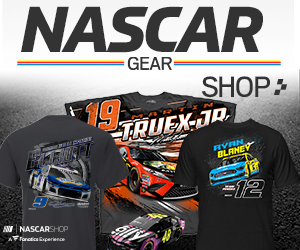 The Monster Energy NASCAR Cup Series heads to Richmond International Raceway Sunday for the Toyota Owners 400 at 2:00 p.m. ET.